The most-widely used curriculum for working with men who batter. 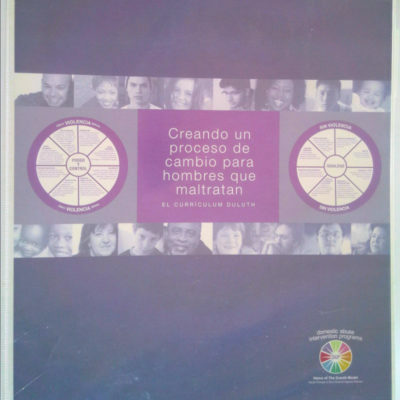 The Creando un Proceso de Cambio para Hombres que Maltratan facilitator’s manual provides basic Duluth Model theory and other information for working with Latinos or Latino-American men who batter. It includes detailed lesson plans (including exercises) for up to 30 weeks of classes, notes for instructors, and sample handouts and forms. These DVDs include short vignettes depicting power-and-control tactics used by men who batter. All vignettes feature Latino and Latina actors and culturally relevant themes, and each vignette corresponds to a curriculum section. Fourteen vignettes are in Spanish, and 15 are in English. Six Latinas who have been battered describe how tactics on the Power and Control Wheel were used against them, and discuss impacts of abuse on their children, their relationships, and themselves. The DVD is in Spanish, and edited into separate segments for each theme. 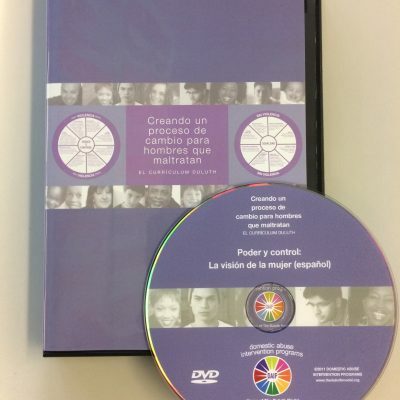 Video footage of a men’s nonviolence class led by expert facilitators in Duluth, intercut with reflections from the facilitators, makes these DVDs great tools for learning how to use the Control Log, Equality Log and role-plays. 22″ x 20″ posters of the Power and Control Wheel and Equality Wheel in Spanish. Because our experience tells us training is valuable and necessary for understanding this curriculum and using it as effectively as possible, we require Creating a Process of Change or Creando un Proceso de Cambio para Hombres que Maltratan training as prerequisite for buying the curriculum. DAIP curricula are grounded in the Duluth Model, a constantly evolving philosophy and practice based in DAIP’s work to end men’s violence against women through coordinated community response. The philosophy and concepts that guide the material can be challenging for both new and experienced facilitators. Training provides important opportunities for participants to understand the curriculum and the process of facilitation, to examine their motivation for doing batterer-intervention work, and to examine their beliefs about men who batter and women who are battered. It is perfect for anyone who is starting a batterer intervention program, who is new to men’s non-violence group facilitation, or who has been facilitating for a while and would like to refresh their insight and information. DAIP strongly encourages anyone who is using early versions of the curriculum, or parts or adaptations of more-recent versions, to complete a training program. Learning about the curriculum in this context will productively challenge and change how facilitators perceive and practice their work. • Call 1-866-417-6111, option 1, and ask us to find you in our training database. To learn more about training opportunities, please visit the training page at www.theduluthmodel.org.